PETALUMA, Calif. (BRAIN) — Yuba Bicycles and Currie Technologies have teamed up to launch the Spicy Curry, a electric cargo bike that will be officially introduced at next week's Sea Otter Classic. The companies will have a fleet of the new model, called the Spicy Curry, available for test rides at the event. The model will be ready for delivery in early June, retailing for $4,500. The bike will be sold through both Currie and Yuba dealers. "The Spicy Curry is a smart transportation solution for families, tradesmen, entrepreneurs and small business owners who want to ride more, drive less, live healthier and lower their carbon footprint," said Benjamin Sarrazin, the founder and owner of Yuba Bicycles. "Shop for a week's worth of groceries. Pedal kids to school. Lug your tools to the jobsite. Deliver pizzas. We designed the Spicy Curry to be the most practical, safe and powerful cargo bike on the market for the widest range of people." Currie Tech president Larry Pizzi said the model marks the first time the company has made its Currie Electro-Drive drivetrain available to a brand outside of the Accell family bike brands. The system is used on IZIP, Raleigh and Diamondback e-bike models however. 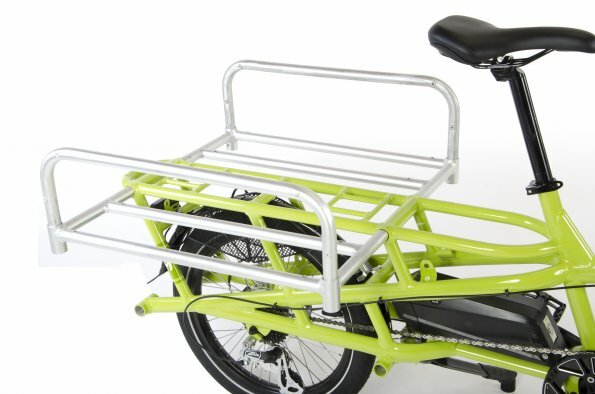 The Spicy Curry includes an extra-strong rear rack allowing users to carry children, groceries, tools, packages or any large object that normally requires a car. The Spicy Curry frame also features a low-rider cargo rack and a 20-inch rear wheel that lowers its center of gravity. The rear rack has integrated adapters to easily install or remove one or two Yepp child seats. Older passengers can sit on the rear by adding a Yuba Soft-Spot seat pad and hold-on Ring. The bike uses Currie's Centerdrive TranzX M15, an integrated mid-drive 350-watt electric motor paired with their 48-volt, 8.8 Amp-hour battery. Power is managed with a switch on the left grip, allowing riders to choose between four levels of pedal-assist or throttle. An integrated locking mechanism on the rear wheel deters theft. The bike also has hydraulic disc brakes and LED lights.